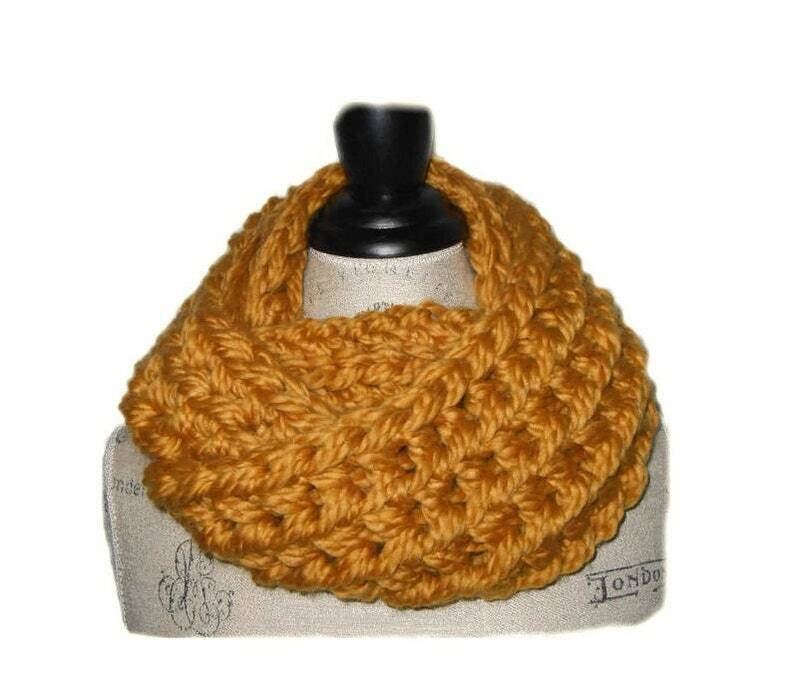 Infinity scarf cowl chunky, handmade crochet in mustard gold, goldenrod, in a very popular Exclusive 2 Sisters Handmade design. DOUBLE strands of super bulky yarn are used to make the eternity scarf thicker, warmer and SUPER chunky. Super Chunky Infinity Scarf Cowl! The infiniti scarf is this season's accessories must have! The size is about 5 - 5.5" inches wide and 48 - 50" inches in one continuous loop. There is a slight 1/2 inch stitch variation where each row is joined (seam). It looks excellent as a long circle scarf or loop it for a super chunky cowl scarf. CARE: Handwash cold, Blot with Towel, Lay Flat to Dry.